Book restoration expert Brooklyn Wainwright is happy to be attending the world-renowned Edinburgh Book Fair. But then her ex, Kyle McVee, shows up with a bombshell. He has an original copy of a scandalous text that could change history—and humiliate the beloved British monarchy. "Brooklyn's uncommon occupation drives the well-constructed and smoothly executed mystery. Offbeat secondary characters contrast nicely with the more levelheaded Brooklyn." "If you're headed to the Edinburgh Book Fair this month, you should pack comfortable shoes, a raincoat with a hood, and a copy of Kate Carlisle's bonnie little mystery, If Books Could Kill." "Carlisle's story is captivating, and she peoples it with a cast of eccentrics. Books seldom kill, of course, but this one could murder an early bedtime." "The mystery plot is light-hearted and cozy but with depth enough to keep me guessing for a while, and the romance that is intertwined and humor amongst the eclectic cast of characters kept a smile on my face throughout the book." "A witty, thrilling, and suspenseful story. From the first page until the last, you will be captured by the description of Edinburgh and Brooklyn's plight. Excitement bounds off each page! This twisty tale will keep you guessing until the very end. I feel like Brooklyn is an old friend and hope to meet her again in another mystery." "Funny, fast-paced, and romantic all at once, If Books Could Kill is not to be missed!" "A smart, sassy, fast-paced mystery with quirky characters that make me laugh and enough twists and turns to keep me guessing through most of the book. 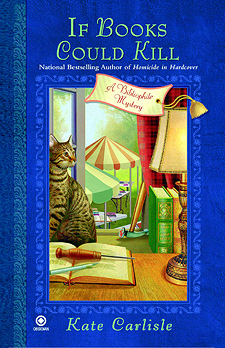 Her vivid descriptions of Edinburgh and the surrounding areas are captivating and the bookbinding tidbits and trivia that are seamlessly woven into the story, fascinating, but it's the characters that make this tale shine ... For an enjoyable mystery with plenty of quirky humor, I highly recommend both of Carlisle's Bibliophile Mysteries."